Starting to plan a bachelor or bachelorette party, but trying not to break the bank? It’s tough. We hear you. But if you host your party in Seattle Southside, you can really get the most bang for your buck. We’ve got plenty of hotels, tons of group-friendly restaurants, and plenty of variety when it comes to activities. Ohhh, we’ve got’em – and for a good price too! With over 50+ hotels in Seattle Southside, typically priced 20-30% less than downtown Seattle, you’ll have plenty of options to accommodate your group, no matter how large it may be. Not to mention, if you’re staying in a SeaTac hotel, you can hitch a ride on the Seattle Southside Express FREE mall shuttle! This’ll take you to the hot spot for restaurants, bars, shopping, and activity that is Westfield Southcenter. It’s great for daytime/evening activities. There are so many fantastic restaurants and bars in Seattle Southside, so I’ll try to narrow it down to some of the ideal spots for groups/bachelor/bachelorette parties. All Star Sports Bar is a place that knows how party: they’ve got great drinks and food, great music, a lively crowd, PLUS ping pong and pool tables! 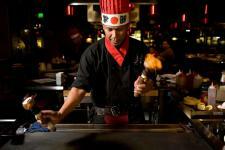 Mizu Japanese Steakhouse is a great spot for a group looking for dinner and a show! It’s a classic hibachi restaurant, done right from top to bottom. The chefs are professional spatula flippers and the food they cook up is incredible. They also have delicious sushi, special chef’s creations (like popcorn lobster) and plenty of traditional Japanese and American drinks. A quick rundown of some other restaurant ideas for your big night…The friendly and attentive Twin Peaks girls serve cold drinks and hot and tasty comfort food. Buffalo Wild Wings has more big screen TVs broadcasting sports than you’ll ever see in one place in your life. Side note: if you didn’t know, they also have wings and beer. JOEY Southcenter is more of a club scene with fancy drinks and unique culinary offerings that might surprise you; plus, they have a great private room for your group. Odin Brewing Co. has a great tap room and brewery for your Viking/Shieldmaiden gathering, or pick up a keg from them and take the party elsewhere. 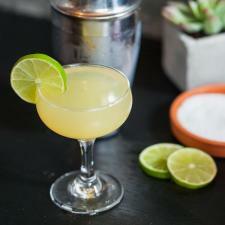 Finally, Moctezuma’s Mexican Restaurant & Tequila Bar has gourmet Mexican food that you won’t believe and plenty of top notch Mexican tequila to go with it. Boy, where do I start? There are plenty of activity options around these parts for bridal parties of all interests. Whether you’re looking for a relaxing spa day, a night out on the town, or a thrilling high-tech laser tag experience, there’s something for everybody around here! Let’s talk about a few, shall we? How about a day on the golf course? Foster Golf Links is a sprawling metropolis of golf heaven nestled along the Duwamish River. After 18 holes, you really don’t have to go far to find some good food and drinks…you don’t even have to leave the golf course. Billy Baroo’s offers some great beer and wine options to wash down their delicious steak and seafood. Everybody needs some relaxation and destress time before the wedding, right? 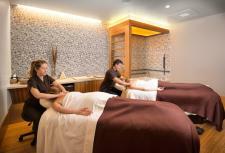 Spend a day at the elegant and luxurious Spa at Cedarbrook. Just listen to some of these spa treatment options: Sea Salt Exfoliation with Rainwater Hydrotherapy, Alaskan Glacial Mud Wrap, Restorative Rosehip Facial, Hot Stone or Petrified Wood Massage…you can almost feel it! Plus, they love taking care of brides and grooms to be. How about some tactical laser tag, virtual reality, wood-fired pizza and beer? If that sounds enticing, then Virtual Sports is the place to be. They offer some truly one-of-a-kind experiences and they have great rates for group packages! Bring your COD squad to a real venue and see how you handle zombies in the real world. Just a few more ideas…Ride the glass elevator to the 14th floor of the DoubleTree by Hilton Hotel Seattle Airport, to Maxi’s Lounge and Nightclub and dance the night away. 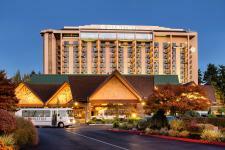 Hit up the Great American Casino for some Texas Hold’em, Blackjack, Baccarat and more. Head to ACME Bowl or Round 1 for some state-of-the-art bowling and video games! A couple of quick tips for party planning: stop by Total Wine & More for a great selection of wine, beer, spirits, cigars and more for your party needs. Check out Party City for decorations and anything else you might need for your bachelor/bachelorette bash. Finally, reach out to us for help planning. Our concierge staff can assist you book your hotel, arrange a party bus, dinner/activity reservations, or whatever you might need. Call us up at (206) 575-2489, and we’ll help make your bachelor/bachelorette party a blast in Seattle Southside!